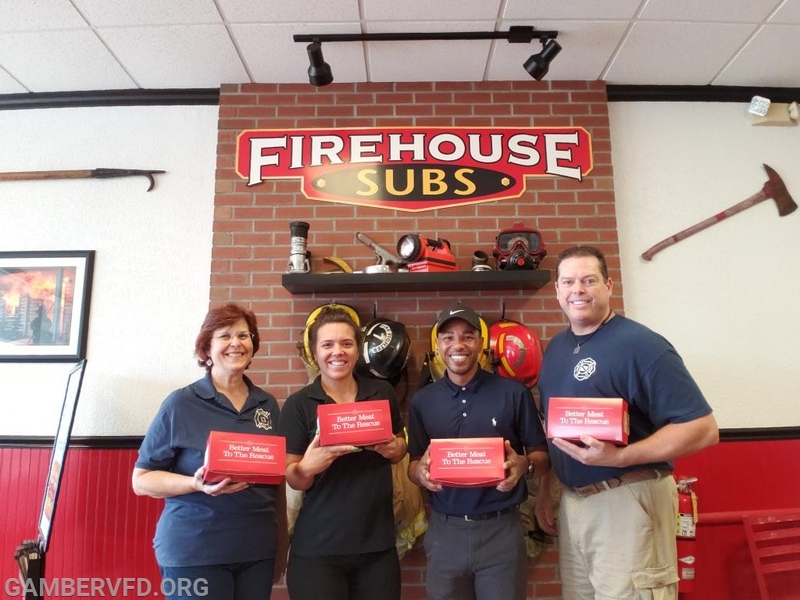 Beginning at 0630 on Saturday morning, two members, Rose Pandolfini and Bruce Bouch, ascended on Firehouse Subs in Westminster to assist the owner, Dexter White and his store manager Melissa Teresi with preparing 250 box lunches. This is but a small amount of the 9,000 requested from all Firehouse Subs locations to support those who are in the devastating path of Hurricane Florence in the Carolina's. Dexter had already packed 50 boxes on Thursday while his employees continued serving his hungry customers. Having a discussion with Dexter during his work efforts, we learned of the additional boxes that needed to be packed and shipped out by Saturday afternoon. Gamber & Community Fire Company has benefited from two prior grants from Firehouse Subs that supported our efforts to assist our community. So it only seemed fitting that we should help them reach their goal. Within three hours all 250 box lunches were packed up and made ready for delivery by a refrigerated truck heading to the Carolina's. We packed 250 boxes full of delicious food. Subs varied between corned beef, pastrami, turkey, roast beef, and ham. Dexter was following the video guidelines provided from Firehouse Subs for getting 25 boxes to fit perfectly in each box.